Mary Shelley was a British author who wrote the world famous ‘Frankenstein’. The novel was a reflection of Mary’s own sense of alienation and isolation. Frankenstein also proved to be an important mark in making literature contributions by women acceptable. Although Mary Shelley wrote more, none of her other works gained the popularity Frankenstein did. Some of her other works include, Lodore (1835), Faulkner (1937), Mathilde (1959), Valperga or the Life and Adventures of Castruccia, Prince of Lucca (1823), The Last Man (1826), and The Fortunes of Perkin Warbeck (1830). In addition to these, Shelley also wrote a number of short stories, travelogues and other works. Mary Shelley was born in London on August 30, 1797. Her father William Godwin wrote the famous An Enquiry Concerning Political Justice (1793) and her mother, Mary Wollstonecraft was famous for writing A Vindication of the Rights of Women (1792). Mary Wollstonecraft died only ten years after the birth of Mary Shelley. Being born to parents with literary interests, it was no surprise that Mary grew up to be a writer herself. Holding a keen interest in literature, Mary was self educated. Her interests were given a boost by the environment in which she was raised. She was highly influenced by her father’s friends and acquaintances like Charles Lamb, Percy Bysshe Shelley and Samuel Tylor Coleridge. Mary published her first poem at the age of ten followed by many more publications. In 1812, Mary met Percy Shelley. The two became involved in a controversial romance since Percy was already married and his wife was expecting their first child. Mary ran away with Percy at the age of 16 and the two travelled to France and Switzerland. However, they did not marry until 1816 when Percy’s wife committed suicide by drowning herself. In 1818, Mary gave birth to a daughter. A year later she gave birth to another child, a son. Unfortunately, both her children died and Mary suffered a nervous breakdown. Again in 1822, Mary had a miscarriage. In the same year, Percy Shelley drowned. Although Mary Shelley wrote many works, her biggest achievement was the creation of the most memorable monster, Frankenstein. It is believed that the story was a result of a dare made by Lord Byron that she write a ghost story. Frankenstein became one of the first bestselling works to be published by a woman. Frankenstein is still widely read and has inspired various adaptations to the stage and screen. 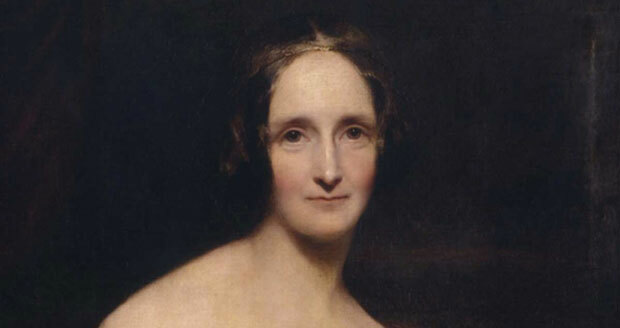 On February 1, 1851, at the age of 54, Mary Shelley died in sleep as a result of a brain tumor. She was living in London at the time of her death. Mary Shelley’s body was laid to rest at the Saint Peter’s Churchyard/Bournemouth Cemetery in Bournemouth, Dorset, England.